Milnor PBW™ PulseFlow® Batch Washers are modular machines in which batches of laundry progress through a complete wash cycle by moving from module to module. Each module performs a specific portion of the wash process. Water flows in the opposite direction of the goods, creating a built-in water reuse system. A tunnel washer is part of a complete system that usually includes a press or centrifugal extractor, dryers, and conveyors to move laundry automatically. Each Milnor CBW® Batch Washer is custom-made for the customer's specific needs. More modules result in greater production. Water inlets and drain valves give greater flexibility. Mentor® Control allows pre-determined temperature and chemical levels for each individual bath. The operator puts a batch in line for loading and enters the laundry classification number into the Mentor® Control. This automatically selects the processing formula which follows the batch until it's automatically unloaded from the dryer and delivered to its finishing destination. A conveyor or overhead bag system quickly feeds the load chute. Each module has a stationary shell to hold the wash bath and a rotating, perforated inner cylinder. Each module can be used for different baths. Laundry proceeds through the formula by traveling from module to module via a perforated top transfer scoop. There are no stops and starts for draining and filling after each bath. This saves a lot of time compared to conventional washing machinery. Any module can be equipped with a steam inlet and temperature probe. Supply inlets can be placed in each module. The Mentor® Control dictates the amount of supplies and when, or if, they are added to the specific goods in each module during the wash cycle. The MultiTrac™ system relays each batch's post-wash requirements to other parts of the system; extractor, shuttle, dryers and conveyors. A CRT display identifies batch location and status. 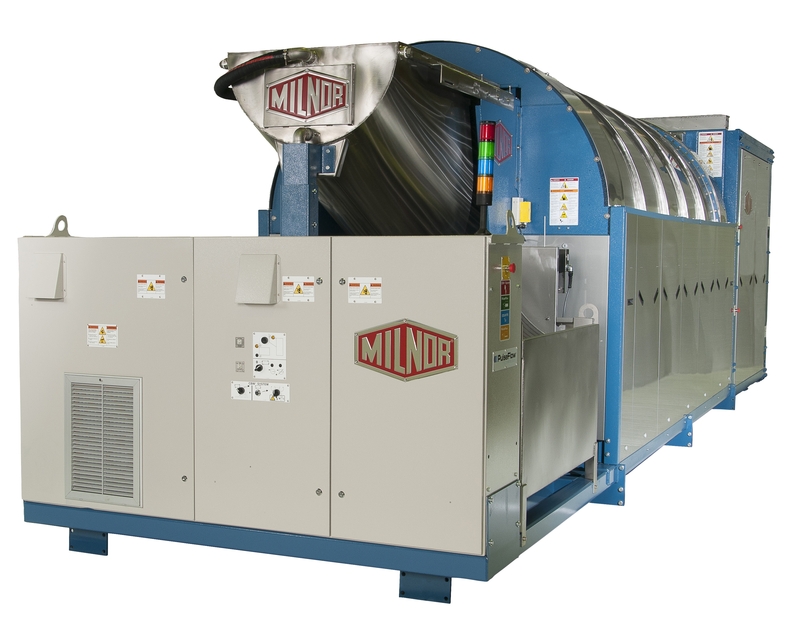 When multiple batch dryers are used, the control system prevents mixing of incompatible batches in the same dryer. Milnor top transfer CBW® washers have proven higher productivity in more than 1,000 installations worldwide. They wash faster than other tunnel washers due to superior dilution which means better soil removal. Milnor's top transfer feature assures bath integrity. Baths are truly independent, so the washing formula can work as planned. Because water is not pumped forward with each transfer, chemicals are better targeted to the proper baths. They don't migrate uncontrollably to subsequent baths. Titrations show that with a Milnor, it's far easier to control pH levels. Click here for more information on Milnor PBW™ PulseFlow® Batch Washers.